This book kept popping up on my news feed. It has great reviews and I'm a sucker for short stories. 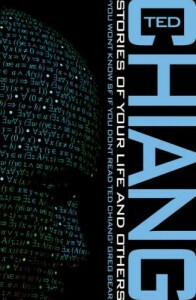 I admit I've never read anything by Ted Chiang, never heard of him, but that's not his fault I am horrible with names and remembering titles half the time. The stories I usually remember if they are good. I named my son Corwin after a character in a book and forgot the book for the longest time.. I remembered most about the story not the title, typical me. My point is Ted Chiang may be an awesome writer and have been around for years. I'll find out after this book. So far only half way through the first story, Tower of Babylon. Let's hope this lives up to the rave reviews and more importantly for me I actually remember the titles and author.